Hi everyone! I have been seeing so many amazing stamping decal manis lately, so I finally decided to try it out for myself! I honestly have no idea who started this awesome trend, so if you know, please be sure to tell me!! I thought about going with a less detailed stamping image for my first go around with this, but ... go big or go home, right!? I started off with three coats of Polish Revolution Florals ... for Spring?, and two coats of OPI Mermaid Tears on my middle and ring fingers. 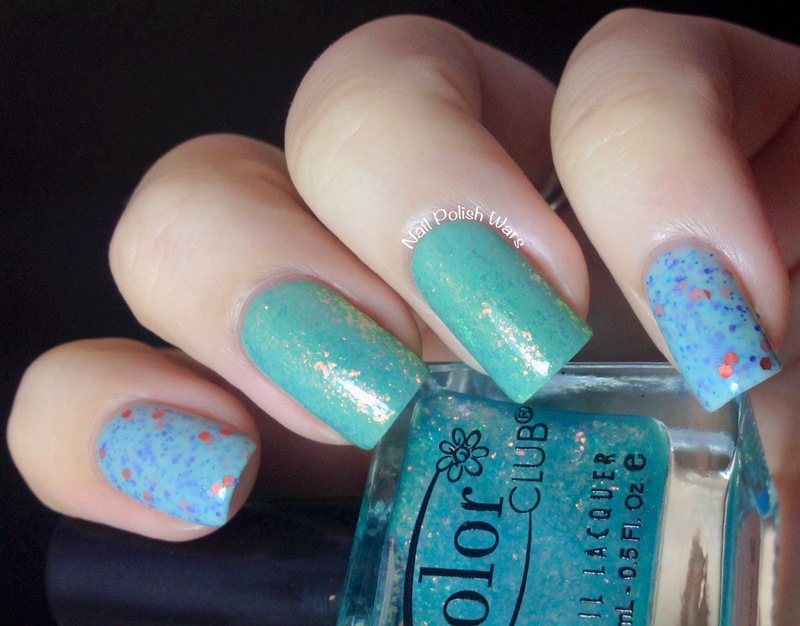 I added one coat of Color Club Galactic Garden over Mermaid Tears to add a bit of depth to it. To create my stamping decal, I paired Konad Special Black with Messy Mansion plate MM-29. Once I transferred the image to my stamper, I waited a few minutes to make sure it was dry. Since the design spacing was so intricate, I used my dotting tools and a toothpick to fill in the spaces using Barielle Banana Drop, OPI Over and Over A-Gwen, Nicole by OPI Half Charming Half Alarming, Zoya Sara, Nicole by OPI White Base, and Zoya Arizona. I waited about fifteen minutes for the polish to dry on the stamper, and then I added one coat of SV. While waiting for the top coat to dry on the stamper, I applied one coat of SV to my nails. Before it was completely dry, I gently removed the image from the stamper by lifting the edge of the top coat line with a pair of tweezers. I laid it over my nail, smoothed it, and trimmed it down to fit properly. I finished by adding one coat of SV over it. 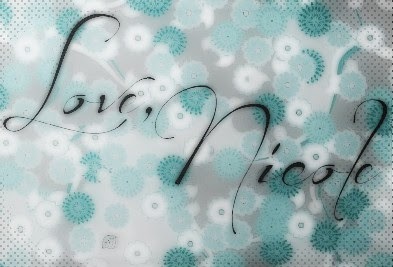 I really enjoyed creating this stamping decal! I'm so excited to try it again! I hope you enjoyed! That looks amazing! I definitely need to try the stamp decal technique too! Um this is amazing. That is all. So pretty! 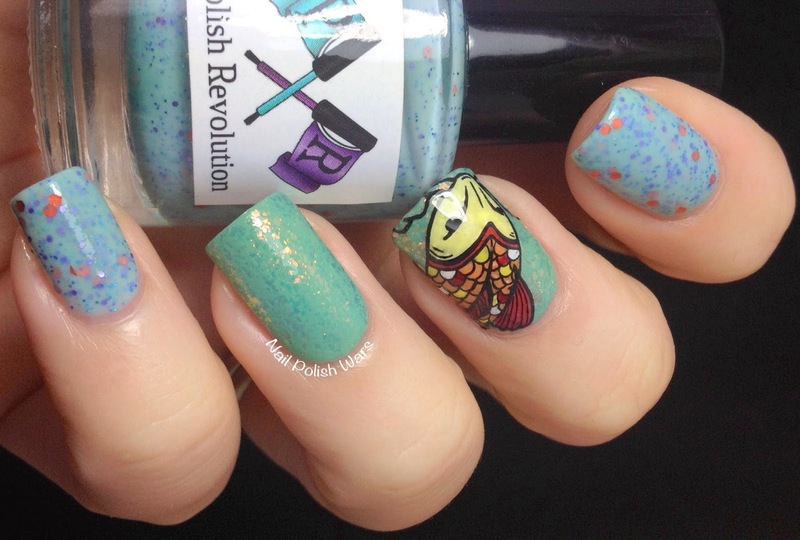 You picked great polishes to look like water!! Now, you just blew me away with that decal. First time I saw it was Natalie from Nailz Craze who did it with that gorgeous rose from her NC06 plate. Gorgeous! 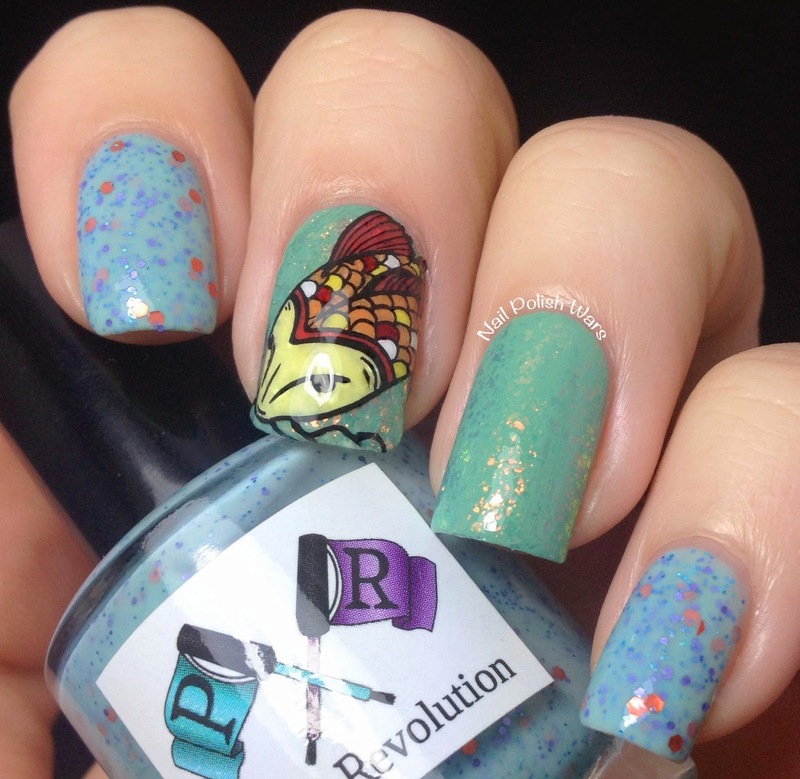 I love your layering and the koi decal looks so awesome :) It also reminds me of an old Office episode where Michael Scott falls into a hotel lobby koi pond, lolol. You did go big girl and it turned out amazing! I agree, whoever started this is a genius! Gorgeous stamp!! Also, love the colors you used here, so pretty. Wowzers, that decal you made is fantastic. Love the colors you chose for each area - they all look so good together. 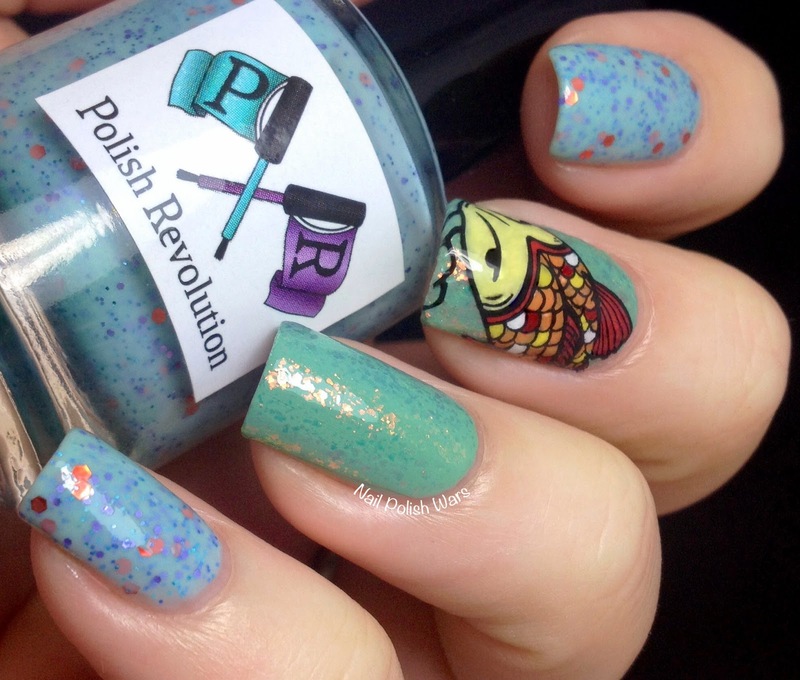 Also really like that Polish Revolution Florals ... for Spring?. Thanks for showing us your design. wow you did an incredible job!